Overview - Five young New Yorkers throw their friend a going-away party the night that a monster the size of a skyscraper descends upon the city. Told from the point of view of their video camera, the film is a document of their attempt to survive the most surreal, horrifying event of their lives. In 1998, Hollywood attempted to revive a classic Japanese monster and deliver citywide devastation to the cinematic masses. Unfortunately, Roland Emmerich’s 'Godzilla' was the result of their efforts. Loaded with paper-thin characters, comical disaster sequences, and a relatively harmless monster, this monumental failure left a sour taste in the mouth of audiences across the world. It would take Hollywood nearly ten years to unleash another destructive lizard on New York City, this time in the form of a cryptic beastie. A viral marketing campaign for the enigmatic 'Cloverfield' appeared without warning, offering salivating creature-feature fans glimpses of massive destruction left in the path of... something. Told entirely from the perspective of a single handheld video camera, ‘Cloverfield’ follows a pack of young New Yorkers scrambling to survive the assault of an enormous creature. The newly-formed band of survivors includes a businessman named Rob (Michael Stahl-David), his best friend and camera-toting pal Hud (T.J. Miller), his brother Jason (Mike Vogel), Jason’s girlfriend Lily (Jessica Lucas), and a resident red-shirt named Marlena (Lizzy Caplan). After witnessing the vast devastation left by the monster with their own eyes, the group frantically tries to escape the city. However, when Rob gets a desperate call from his ex-flame Beth (Odette Yustman), he decides to turn back and try to rescue her before it’s too late. 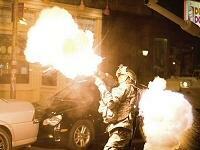 'Cloverfield' could have been awful. Its handheld camera gimmick could have devolved into a repetitive stunt, its characters could have been stale caricatures, and its story could have been underdeveloped and flimsy. Thankfully, producer J.J. Abrams and rookie film director Matt Reeves seemed to have anticipated these potential problems since they address each one early in the film. Rob’s birthday party provides the perfect framework for the logistics of the handheld documentation of the attack, a series of farewell messages to Rob allow the filmmakers to introduce characters without unnatural exposition, and Rob’s unrelenting love for a girl he can’t have allows his character to run into danger instead of away from it. I was thoroughly pleased with the connection I felt to the characters and their struggles. Deaths felt more personal than I expected, and the crumbling city sent chills down my spine. It doesn’t hurt that the cinematography is fantastic. Don’t be fooled into assuming the film’s handheld perspective will limit the impact of the story -- each shot has been carefully plotted to generate palpable tension and entertaining thrills. Glimpses of the monster are fleeting and -- as a result -- startling. The beast appears to be literally larger-than-life because we initially can’t see its entire form from our position on the ground. Adding even greater dimension to the film is the filmmakers’ convincing vision of a ruined city. Glass falls like rain, skyscrapers shatter violently and topple to the ground, and ominous billows of smoke pour through each city block. The imagery is immediately evocative of September 11th and its similarities are played to great effect without feeling gratuitous. All in all, Reeves and Abrams know how to create atmosphere and they do so with increasing intensity at every turn. Regardless of my expectations, I was captivated by 'Cloverfield's unwaveringly bleak tone, its cast of fairly compelling characters, and its stunning special effects. Best of all, I laughed, squirmed in my seat, and exhaled sharply on more than one occasion. 'Cloverfield' may not reinvent the genre wheel, but it offers everything Roland Emmerich’s ‘Godzilla’ failed to deliver ten years ago. The moment I walked out of the theater back in January, I began to wonder how 'Cloverfield' would handle the transition to high-def disc. Honestly, I imagined a blurry, noisy mess akin to ’28 Days Later,’ a sub-par release that failed to provide a substantial upgrade over its standard DVD counterpart. I certainly didn’t expect a sharp and attractive transfer that renders every shard of rubble with a level of care afforded to the best BD titles on the market. 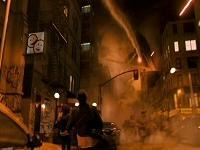 Presented with a striking 1080p/VC-1 transfer, 'Cloverfield' looks wonderful. The film’s undersaturated palette isn’t meant to explode off the screen, but the image is blessed with strong primaries and incredibly natural skintones. The orange haze of fire and the yellow smear of streetlights look especially remarkable, giving each scene a distinct (yet consistent) tone. Black levels may be slightly uneven at times (the tunnel scenes falter a bit), but dark expanses and shadows are deep and well-delineated throughout the majority of the film. Better still, the level of fine object defies the conventions of the film’s camcorder gimmick and produces a series of astonishing textures and crisp edges. Sure, there are intentional bursts of static and softness littered throughout the production, but these irregularities always register as enhancements to the tone of the film rather than distractions from the picture quality. Best of all, there isn’t any edge enhancement, major crushing, or significant artifacting to be found. There are light swarms of source noise in the darkest scenes, but nothing that undermines the overall quality of the transfer. If any relative charge can be leveled against this transfer it’s that it doesn’t pack quite the same wow factor as glossier Blu-ray releases. As it stands, this gritty creature-feature isn’t the greatest thing I’ve ever seen crash across my screen, but it genuinely shattered my expectations. Considering its filmmakers worked overtime to make it look like something captured on a handheld camera, this Blu-ray presentation of 'Cloverfield' is an impressive sight to behold. ’Cloverfield’ may look great in high definition, but it sounds even better. Paramount has mastered a reference-quality Dolby TrueHD 5.1 surround track that perfectly captures the authority and resonance of the film’s theatrical presentation. First and foremost, the actors’ lines are crisp and clean despite intentional alterations to their vocal timbre (the filmmakers have intentionally processed the dialogue to sound as if it’s been captured on a camcorder). More importantly, prioritization is flawless even when deafening chaos realistically overwhelms key elements of the soundfield. Crowd screams are suddenly muffled any time a room-shaking roar or building collapse floods the soundscape. In these moments, outstanding LFE support left me in sheer awe of the nuanced low-end pulses pouring from my subwoofer. To top it all off, my rear speakers were constantly brimming with effects neatly linked to every object on the screen, regardless of its size or significance. Even from a technical perspective, I had a hard time finding fault with 'Cloverfield’s audio. The underground subway attack exhibits perfect channel pans, the bridge collapse features extraordinary directionality, and the high-rise climb showcases delicate acoustics and absorbing effects. Ambiance takes such a central and pervasive role in the film that I can’t think of a single moment where I was reminded I was watching a movie -- the soundfield was so involving that I remained fully immersed in the film from beginning to end. I hesitate to make such definitive declarations about a title, but 'Cloverfield' unquestionably boasts one of the strongest audio tracks I’ve heard all year. 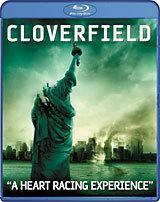 This Blu-ray edition of 'Cloverfield' packs in all of the special features that appear on the standard DVD. presented here in high definition. But that's not all -- this edition also includes a substantial Blu-ray exclusive (discussed in the next section). Director’s Commentary -- Matt Reeves sits down to talk about the origins of 'Cloverfield,' the locations for the shoot, the stylistic direction of the cinematography, and the extent of producer J.J. Abrams involvement in the project. I was happy to find the former television director to be refreshingly candid throughout the proceedings, discussing everything fans of the film would find valuable withoutspending too much time on the technical aspects of the special effects. While this track probably won’t win over anyone who didn’t enjoy the film, it’s definitely worth a listen. The Making of Cloverfield (HD, 28 minutes) -- This dry featurette is the first ina collection of peices that explore the production of 'Cloverfield.' Focusing on the cast and crew, producer J.J. Abrams, and the extensive sets and locations used in the film, this one uses interviews and behind-the-scenes footage to deliver a fairly standard EPK. Cloverfield Visual Effects (HD, 23 minutes) -- This second featurette gives a complete overview of the Cloverfield beastie, the CG-enhanced destruction of New York, the creature’s miniature spawn, and the effects used to highlight the feel of the handheld camera. I appreciated all of the information in this peice, but I particularly enjoyed that it showed the cast and crew working to make the effects more realistic through their performances. I Saw It! It’s Alive! It’s Huge! (HD, 6 minutes) -- This all-too-brief featurette focuses on the design of the Cloverfield monster, its history as a character, and its on-screen biology and motivations. Deleted Scenes (HD, 3 minutes) -- Presented with optional director’s commentary, the four bland cuts featured in this collection wouldn’t have added much to the final film. Alternate Endings (HD, 5 minutes) -- The deleted scenes may be a bust, but the two alternate endings are a blast. They’ll certainly give fans something to debate until the inevitable sequel makes its way to theaters. Like the regular cuts, the alternate endings are also presented with optional director’s commentary. Clover Fun (HD, 4 minutes) -- A decent series of outtakes. ’Cloverfield’ may not live up to everyone’s expectations, but I really enjoyed its ambition, atmosphere, and characters. Regardless of your opinion of the film itself, Paramount has definitely made its return to Blu-ray in style. This BD edition of ‘Cloverfield’ offers fans a surprisingly strong video transfer that easily outclasses the standard DVD, a reference-quality TrueHD audio track, and a thorough collection of supplements. An easy recommend all around.